The Now-Ubiquitous “Times New Roman” Font Was Originally Commissioned By? Which Author Was Forced To Bring One Of His Beloved Characters Back To Life After Years Of Public Pressure? If you’re a reader of American origin, we will absolutely forgive you for assuming that the ubiquitous font, Times New Roman, is somehow tied to the giant American journalistic institution The New York Times. The font did not originate with The New York Times, however, but with a much older institution: the British newspaper The Times (referred to here, in our answer selection, as The Times of London due to how it is known around the globe). The font was commissioned in 1931 by The Times and designed by Stanley Morison, an advisor to the British branch of the printing equipment company Monotype, in collaboration with Victor Lardent, an artist in The Times’ advertising department. 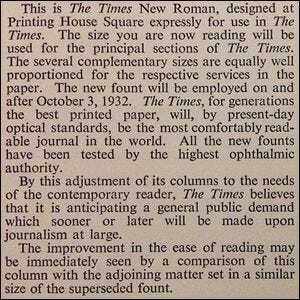 This is The Times New Roman, designed at Printing House Square expressly for use in The Times. The size you are now reading will be used for the principle sections of The Times. The several complementary sizes are equally well proportioned for respective services in the paper. The new fount will be employed on and after October 3, 1932. The Times, for generations the best printed paper, will, by present-day optical standards, be the most comfortably readable journal in the world. All the new founts have been tested by the highest ophthalmic authority. We can stop right there in the transcription, because frankly, they had us at “highest ophthalmic authority”. In all seriousness, though, Times New Roman was a significant improvement over previous, more difficult-to-read fonts. It was widely adopted, and it remained the standard font at The Times and other publications well into the late 20th century.